I look at this amazing model kit on display at the 2010 All Japan Hobby Show in Tokyo and my first thought is a robot voice gargling PREHSZ STAAAHT BATTAN. My second thought is I need this. It doesn't matter how much it costs. Actually, now I think about it, I'd need two, one to paint white, the other, black. 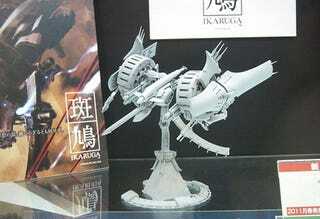 If you've got no idea what I'm talking about, Ikaruga is a shoot-em-up released almost a decade ago that remains a cult favourite, its colour-changing mechanic making it as much a test of wits as a test of reflexes.